CLICK TO GET TICKETS ONLINE! Tuesday - Saturday, 10 am to 6 pm, holidays excepted. For Sunday & Monday ticketed events, the Box Office will open three hours before showtime in the amphitheater/event lawn; two hours before show time in Castle Theater/Yokouchi Pavilion; one hour before show time in McCoy Studio Theater. Order 24 hours/day, 7 days/week! Credit card orders only. Internet fees apply. Box Office phone lines are open Tuesday thru Saturday, 10 a.m. to 6 p.m. Holidays excepted. If you buy tickets by telephone or on the website, the person whose credit card is used for the transaction must bring that credit card and a valid photo ID to the Box Office will-call window to pick up the tickets, for your security. If you need to make other arrangements for ticket pick-up, please contact the Box Office in advance and provide written authorization. Credit card orders only. Use this Ticket Order Form Print the ticket order form and fax completed form to 808-244-8850 or mail it to the MACC Box Office, One Cameron Way, Kahului, HI 96732. 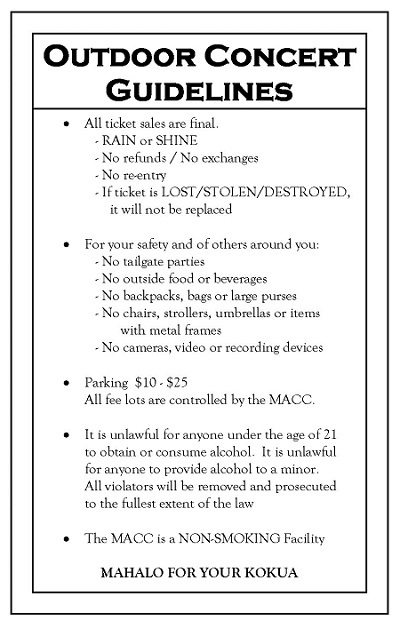 Facility fees and/or handling charges will be added to every ticket purchased through The MACC Box Office. We thank you in advance for understanding that these fees and charges help to offset the costs of operating Maui Arts & Cultural Center. Refund & Exchange Policy: Tickets will be refunded only for cancelled performances. Due to the nature of live performing arts, programs are subject to change, sometimes without prior notice. In this event, tickets will be exchanged for a new date of the same performance. Special Needs: MACC is fully compliant with ADA guidelines, and all performance venues are accessible to individuals with disabilities. Please inform the Box Office of any special needs for you or your party when ordering tickets. For detailed information, click here: IWD accessibility. PUBLIC NOTICE: Public areas at MACC events may be photographed and/or videotaped for promotional and archival purposes. This may include the stage/performance areas as well as all audience areas. Your presence constitutes consent that your image may be used without compensation or legal counsel. No images from MACC events are to be used in any form to promote third party and/or commercial enterprises. 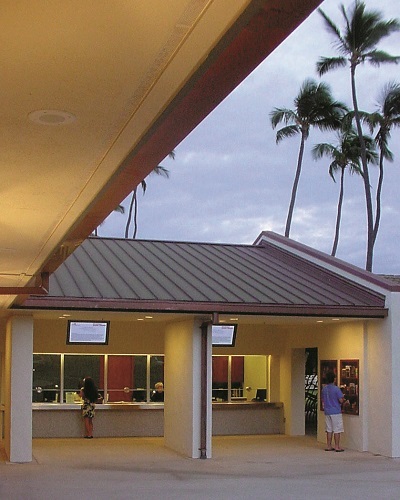 Maui Arts & Cultural Center is not responsible for any items left behind by patrons. However, when items are found on the premises after concerts or events, we offer assistance in returning the items to their owners. Volunteers/staff will record items in the Lost & Found Log, which is located at the reception desk in MACC's Administrative Office. Staff/volunteers will make every attempt to contact the owner of the item, if sufficient identification is on the item. 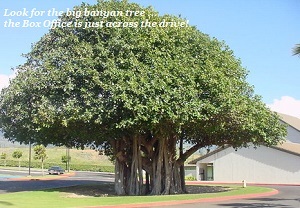 To inquire about a lost item, please email the link below or call 808-242-2787 (reception). In order to claim an item, the owner must describe it as closely as possible, then arrange to pick up the item in the Administrative Office and sign the Lost & Found Log. Bank cards will be destroyed after one week (7 days). Other found items will be donated to charity or discarded after 30 days.